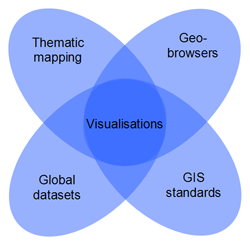 The use of geobrowsers (web mapping applications) has increased considerably over the last number of years. Thematic mapping has a long history in geography but the new geobrowsers tend not to focus on this aspect of geographic information representation. On this blog, I want to evaluate the current support and "workarounds" for thematic mapping in selected geobrowsers (OpenLayers, Google Earth and Maps). This project is initialised by a master's thesis in Geographical Information Science at University of Edinburgh. Here comes your first hit. Can you write something on comparison of different geobrowser after the presentation. So that we would come to know which geobrowser holds maximum functionality.